Elk eat trees, shrubs and other plant-based foods. They're big fans of wild mushrooms and they love the licks. Licks, you say? Plus, any idea how many pounds of food an 800-pound elk eats in a day? Elk (Cervus elaphus) are big. Very big. As such, they eat and drink a lot to sustain themselves. But exactly what do elk eat? First, some basic biology. 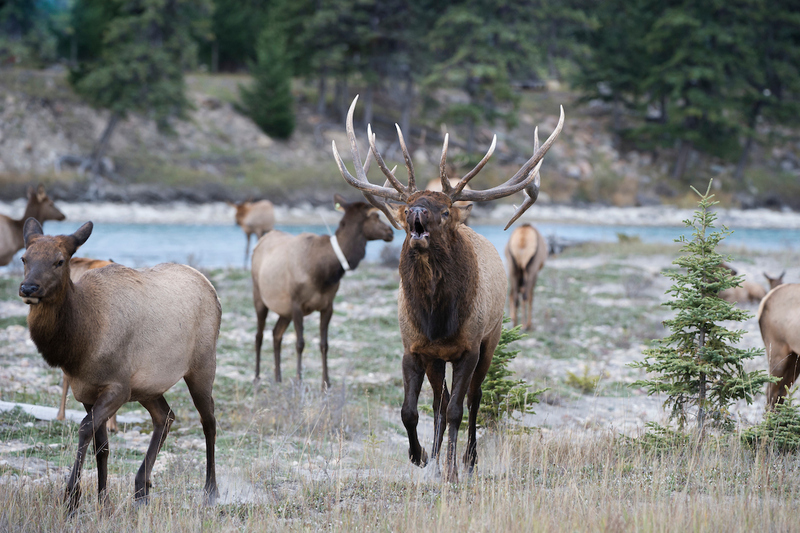 An elk's stomach has four chambers: the first stores food, and the other three digest it. Elk are ruminators (as are deer and moose), which simply means they initially chew their food just enough to swallow it. This food is stored in a stomach called the “rumen.” From there, the food is regurgitated, then re-chewed before being swallowed again, entering a second stomach where digestion begins. Then it passes into third and fourth stomachs before finally entering the intestine. As herbivores, elk only eat vegetation. In spring and summer when food is plentiful, elk are mainly grazers. They primarily eat grasses, sedges and a variety of flowering plants. That’s why they are often found in lush, green mountain meadows — and the alfalfa fields of local ranchers. As summer turns to fall, elk increasingly become browsers, feeding on sprouts and branches of shrubs and trees, including conifers as a last resort when snow covers other plants. During fall and winter, elk continue to eat grasses when these are available and not covered by deep snow. Plus, they're big fans of wild mushrooms. Elk may also supplement their diet at licks — areas in the ground that contain high concentrations of salt and other minerals — where they take in minerals that help them grow healthy coats and produce nutritious milk. How Much Do Elk Eat? On average, an elk eats about three pounds of food per day for every 100 pounds it weighs. That means the average 500 pound cow will consume at least 15 pounds of food every day, while an 800 pound bull will gobble up 24 pounds of food.